Artist description: "Occult divergence in a harsh reality." 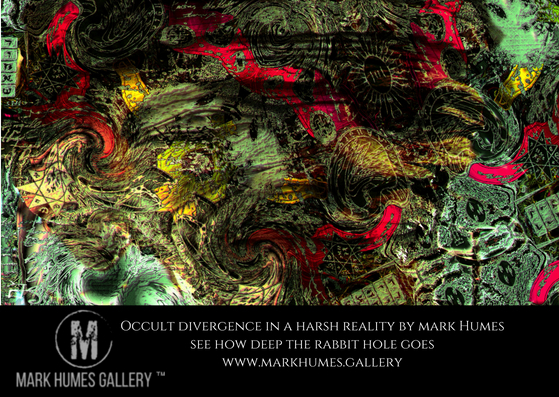 is digital abstract art created by Mark Humes using a color palette of yellow, brown, green, red, black and white depicting a Balinese Witchdoctor overlayed and obscured by occult symbols and scripts. In parts of this artwork, the occult symbols twist into faces of demonic origin. I looked out into the universe with a questioning mind. How did we develop such a firm belief in things unseen? I let my mind drift back in time and form a simulation looking in on early humanity. I saw how it all began, One part guilt and paranoia and the other part logic and manipulation. It was a time when the biggest and strongest ruled, Till logic dawned in one individual. Being a keen observer of nature, he created powerful deities that controlled the seasons and natural events, and he alone was the sole emissary of the gods. The time of rule by raw strength has passed, and people now sought his power, Knowing he could not reveal the truth he created endless rituals and nonsensical knowledge to be memorized. Generations passed based on this hidden lie. The people devoutly believed. They chased the occult and spent their time on this supposed secret knowledge rather than the knowledge of how to better one's self. History is a circle and over time a few figured out the lie learning logic, a force of will and manipulation of others were the keys of power. With this one image, I remove the blinders from your eyes. Now look out into the world with my knowledge and see the world as it is. 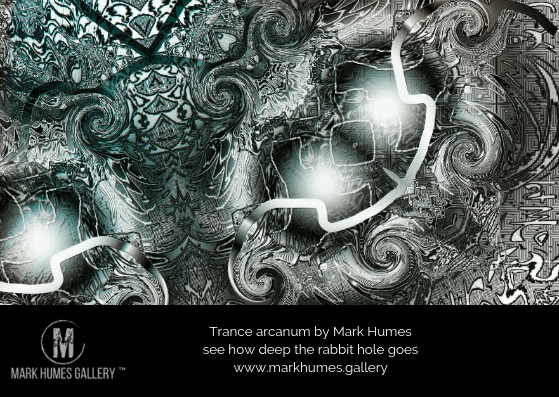 This work of art will be a feature in my soon to be released book, The Book Of Lost Verses: Book 9 that has a tentative release date of November 2018 and is currently available as a print at Mark Humes Gallery. 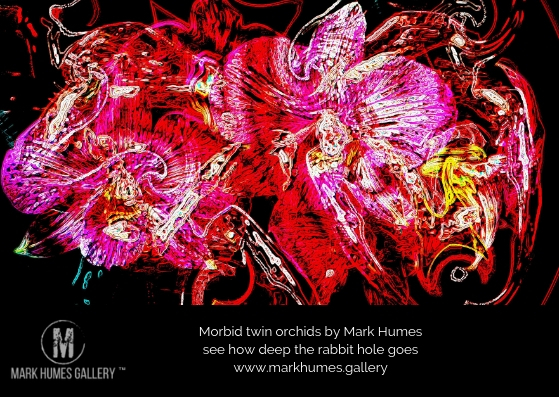 Don't forget Mark Humes Gallery Magazine is Now available on Google Newsstand. Subscribe today to get the latest news on our continuing works of art and events. I was instantly taken with "Occult Divergence" --- I've shared the YouTube video on Twitter and shared this page on my Pinterest "Art on My Heart" board. I'll be thinking of how deep the rabbit hole goes all day. Amazing work. Keep going, my friend. From the Cheshire Cat.